Did you know you can now order your Deliveroo takeaway from Mamounia Lounge Knightsbridge here on View? "Situated on Brompton Road opposite Harrods, the world’s most iconic department store, Mamounia Lounge Knightsbridge offers the same exquisite experience as its Mayfair sister venue, with Middle Eastern cocktails, an outdoor shisha lounge, entertainment and culinary delights. The inviting décor paired with traditional Arabic hospitality provides a more relaxing experience; guests can visit the venue all day for lunchtime dining, an intimate evening meal, or night time drinks. Join us for a delectable halal Afternoon Tea, try out our tasting menu or experiment with our huge range of both charcoal and electronic shisha. 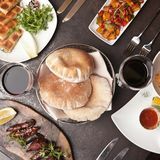 Why not try our huge selection of hot and cold mezze, Lebanese and Moroccan pastries including a tantalising chicken pastilla, or Arabic sweet treats including baklawa and an extensive range of organic teas. 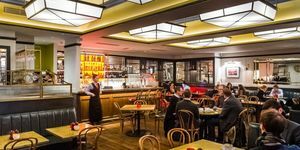 Its ideal location in the heart of London’s most prestigious shopping district makes it the perfect spot for lunch after an indulgent shopping spree or visit to the South Kensington museums, as well as being ideally situated for for post-work drinks with colleagues." By sending this booking your details will only be sent to Mamounia Lounge Knightsbridge and will never be shared with other third parties. By clicking this box you agree to the Terms and Conditions set out above. You can book to reserve an area of Mamounia Lounge Knightsbridge for you and your friends. Just enter your requirements below to see what they have to offer. No minors permitted on the premises after 19:00. What did you think of Mamounia Lounge Knightsbridge? Had a great birthday at Mamounia Knightsbridge. Staff were very accommodating with my menu choice and the slight changes I wanted to make to suit my guests requirements. Staff bought out my dessert with sparklers and a birthday song which was great fun!! Belly dancing is awesome and the food was superb! Overall very happy and will be back for sure. This is still the best shisha in town. Hands down. And nowhere is as good for people watching! I love the location. I used to go to the one in Mayfair, but I'm glad this on opened up too. Food wise, the mezzo platter is amazing. I highly recommend it. Mamounia Lounge has the worse outdoor seating in london! It seems they try to cram in as many people as they can outside for shisha. I've walked by many times and finally I decided to try it last week. The shisha prices were extortionate! The quality of it was a little better than average (slightly), however, the price of shisha here is easily double what you pay in other central london locations. My friend and I each had a shisha to see what could possibly justify charging (minimum) £40 per shisha! Every time you need to get up to use the loo, was like some embarrassing scene where everyone has to get up to let you get by them. The food was horrendously overprice given the poor quality of it. When one of the staff told me they were opening their original location soon. All I could think was good luck to mamounia when they open their mayfair. If this is an indicator of what's to come. Hi We are disappointed to hear that you feel that your experience at Mamounia was not a positive one; we would like to convey our sincere apologies. We do appreciate all feedback and we will use your comments to work on our customer service skills.Please get in touch with us at your earliest convenience on info@mamounialounge.com so we can discuss your experience further. Thanks Mamounia Lounge Knightsbridge. I recently visited this restaurant with my fiancé. Firstly the decor and atmosphere is great along with the cleanliness. I was extremely angered and dissapointed with the tiny food portions which is enough for a 3 year old. Handful of fries for £3.50 and when I mentioned to the waiter is this actually the correct portion? They replied yeah sorry. I laughed at what was an over priced restaurant and not a great deal of great service especially when they also charge you around £4.50 for service which is ridiculous. I finished the food and was still left hungry after already have spent £40!! It's daylight robbery and arrogant smug owner with no care of what customers have to say. You cannot serve happy meal portions to adults and charge extortionate prices. I have never experienced this sort of service and ridiculous pricing on baby portions of food and I would say to you all do not visit this restaurant. Don't be seduced by the glamorous look! You will end up leaving dissapointed. Hi sorry it has taken so long in responding to your review and we are disappointed to hear that you feel that your experience at Mamounia was not a positive one; we would like to convey our sincere apologies. 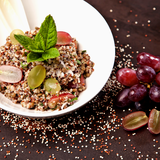 Please get in touch with us at your earliest convenience on info@mamounialounge. com so we can discuss your experience further. Thanks Mamounia Lounge Knightsbridge. Worst customer service ever! I ordered a fresh juice and as they table was a tight squeeze they cleared the glasses and accidentally took my juice. They did replace it but with normal carton juice when I said that I ordered fresh they lied and said conveniently that there machine was broken. The waitress then replied you did not have much left anyway ( there was over half a glass left) ! Very over priced for average food. The only good part was the decor. Definitely do not recommend! I recently had the pleasure of dining at the knightsbridge branch of Mamounia, for the first time. What a pleasure it was. My partner and I had never had 'Moroccan/Lebanese cuisine'. The food was lovely, for starters we had the recommended Mezze platter, mamounia arayes and the mango salad (which was very refreshing!) For our main course we had a Lamb shank tagine and a chicken cous cous, both of them came in colourful tagine bowls and the waitress asked us not to remove the lids ourselves as they were too hot to touch whilst she fetched our sides. When she came back to take the lids off, a whoosh of hot air escaped and was really quite marvellous (at that point you feel like you're not in London anymore) we were glad she removed the lids and not us! ha! after that we were so full! but the waitress recommended us to have a chocolate fondant to share, and luckily we did as it was sooo gooey in the middle... we'd never had a chocolate fondant that good before! Lastly the cocktails! We had an element cocktail (delish!) and my partner ( a big coffee drinker) had the espresso mamounia! Overall, we had a lovely time! I cant wait to go back and try more cocktails! Thank you Mamounia for a great evening!!!! Lovely little gem in Knightsbridge! Decadent dining area! Nice staff, good service. Little bit expensive, but the food and cocktails are amazing! Definitely worth the experience! Hope everyone has as nice an evening as I did! I called Mamounia Lounge Knightsbridge to make a booking and was asked straight away if I have a coupon, which I had. It was a Groupon - I was told they fully booked on Sat. I didn't make any booking and called again in 2 hours and this time, just to check, I said I don't have any coupon – I made a booking for 8:30 PM same Sat! So basically I was lied to before! Althoughgh we arrived on time, and still didn't admit we have Groupon, we had to wait for a table half an hour! After that it finally got better. The service was nice and quick and food was OK but not great. Since we had to wait so long at first we ordered cocktails and they were the best thing in Mamounia. I find it outrageous that they told me they are fully booked just because I had a Groupon. The whole purpose of Groupon is advertisement – I should be so happy that I would go there again and pay the full price. I’m definitely not going back after this. Groupon customers be aware! Went here this weekend with a Groupon voucher, what excellent value for money!! Even if we had paid full price the food would of been worth it!! The staff were very friendly, attentive & knowledgeable. I recommendd the lamb cutlets, the meat melts in your mouth yet crispy on the outside. Great place, will definately go again. I have just returned from this restaurant and to be honest it was way bellow our expectation. I booked it with my friend as a surprise for our partners but unfortunately everything was spoiled.We came there first and my friends were running late so we were sitting there for a while and no one came to us and offered anything to drink for at least 10 min.Food was all wright although not as warm as u would expect. On top of that we had to wait nearly 50min for our mains to arrive and the waiter told us that this Is due to the fact that duck breast "takes a while to cook" - a duck breast takes 15-20 min to be done not 50. On top of that after 30 min of waiting the waitress came over and told me that they have run out of mash - can u believe that - I'm as hungry as hell and they tell me that they don't have what I have ordered !!!!! At this point we were very close to leave the place...Didn't stay for a dessert as we didn't want to wait for it!!!!!! !I wouldn't recommend this place to anyone .Very disappointed .Pictures on the website do not reflect the reality in the restaurant. Looks glamorous but it isn't !!! !Stay away from this restaurant. We went to this restaurant with some friends (4 of us in total). The reastaurant is very nice albeit very cold because of door being left open and air con being on as well. This in addition brought into the restaurant all the smoke from the shisha being smoked on the terrace outside. Being from Lebanon and having eaten in many restaurants both in the UK and abroad, I thought the prices were high, however, it was in knightsbridge, so it was to be expected. The biggest shock, however, was when the mezze (starters) came, they were absolutely tiny, it was terrible. This restaurant is very very stingy with its portions its quite unbelievable. It is the worse Ive seen. If you are hungry and you want to eat, do not go here, you will order so many dishes to fill your stomach, you will eventually end up with a huge bill. The restaurant is very nice and very well decorated,the toilets are very clean, but I do feel they are ripping people of with the portions in relation to the prices they are charging. i love coming here with my girlfriends. nice chilled time, good cocktails, good food and shisha. venues lovely too, everything is well looked after. 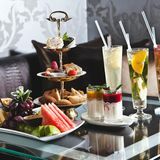 A sister to the Mayfair venue, Mamounia Lounge Kensington indulges you in Arabic culture by stimulating the five senses. And it really is a pleasurable experience. A stone’s throw from Harrods, Mamounia Lounge sits comfortably on the buzzing high street. Stepping in, the inviting smell of subtly sweet incense and dim, intimate lighting welcome you into what feels like a first-class hideaway. Throughout, you’ll notice the attention to detail that keeps your eyes curious and hands itching to touch, from delicate mesh curtains and long fringed curtains used as partitions, to patterned wallpaper, dimpled Ostrich leather seats and gold floral-patterned wall light shades. All this is contrasted by slim, clean lines from the tables, the bar, the cutlery and the glassware, ensuring that it avoids being over elaborate. The decent-sized bar is set in the middle of what's a deceptively long restaurant and displays an impressive collection of spirits, proving this place offers more than food. Outdoor seating at the front is available for those to enjoy the many different flavours of shisha. With the attentive waitresses wearing black hoodies with the venue’s logo on the back, it’s clear that this is simply a place to relax. 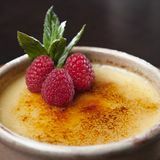 The staff have a good knowledge of each dish and are happy to recommend what’s best. Despite the upper-class location, you’ll find no pretension or arrogance. The clientele is a mix of friends, couples and colleagues, none of whom are particularly dressed-up - it’s a casual affair. A beautiful belly dancer performs on Friday and Saturday nights, and although her making her way around the restaurant is a lovely touch, it can border on awkward as she approaches smaller tables. Chill-out house music with Arabic accents is played for dinner and as the night progresses, more upbeat tunes are played to help crossover into a bar-type feel. The impressive speakers don’t blare out the music but keep it at the perfect volume to have a conversation without allowing your neighbours to eavesdrop. The menu can be overwhelming because there is so much choice, with most of them involving lamb, as per tradition. However there are plenty of vegetarian mezze options too. The must-have mezze are the falafel (£6) which is wondrously moist inside with a crunchy exterior and served with perfectly balanced, tangy tahina; beautifully creamy houmous (£5) served as a ring and with home-made pitta bread; and mohammara (£5) consisting of mixed chopped nuts with chilli and red pepper – you won’t want them to finish. The whitebait (£7) is very generous but might not be to everyone’s taste as it’s very salty with its naturally fishy aroma. The kafta orfalieh with aubergine (£14) is simply delicious, effortlessly erupting with coriander and an understated mix of spices that make this dish so special. Served with brown rice, it's the slice of tortilla coated in chilli sauce and herbs that gives this dish extra oomph. The dish of the day, bamia (£16) served with white rice with vermicelli noodles is slightly less impressive. Despite the gorgeously soft and tender lamb that's stewed to perfection, the dish as a whole feels fairly bland in terms of seasoning and spices when compared to other options. For dessert, the chocolate fondant (£9) and vanilla ice cream is most definitely worth the 20 minute wait: soft, chocolatey and gooey on the inside, this is any chocoholic’s fantasy. For a lighter, more refreshing dessert, the Moroccan pudding habalabia (£6), with chopped pistachios drizzled with a slightly fragrant syrup, is beautifully creamy and silky. The Malbec Shiraz Libertad is an easy, fruity wine to accompany the flavoursome lamb dishes. Mamounia Lounge offers a creative cocktail list with enough varieties appropriate for the venue’s size. The passion fruit mojito (£10) is phenomenal – the combination of mint, sugar, passion fruit and rum is perfection. For those going tee-total, non-alcoholic cocktails are available with optional boosts (£1) to de-stress, or even help love blossom. Good food and an intoxicating atmosphere make Mamounia Lounge a fantastic new addition to Knightsbridge. Make sure you pay a visit before word gets out. 23 destinations curated by Andrew M.